CHAMPAIGN, Ill. – What’s the quickest a Husker has ever earned a Blackshirt mid-season? Not talking games here, but plays. Redshirt freshman linebacker Ben Stille only played 17 snaps last week. Not sure how many he played during Nebraska’s 28-6 win over Illinois on Friday, but they were productive snaps. On a good night for the Blackshirts overall, Stille stood out. He had four tackles on the night. Three of them were behind the Illini line of scrimmage, including one sack. He also forced a fumble. That should make Husker fans pretty anxious to see what more might be in store because Stille has made an impressive case for himself through two games. A little more than a week ago, he was still a third-string defensive end. That was after giving outside linebacker a try during the spring. But injuries to starter Marcus Newby and up-and-comer Tyrin Ferguson left the Huskers shorthanded headed into the Rutgers game. And they came up with what has looked like a simple answer. Everyone else probably should be at Stille’s quick rise. He was part of a wave of Huskers dropping the Illini for losses, 10 of them, on Friday, but with three in this game and one in his debut, Stille now leads Nebraska in that category. Diaco credited the players for Nebraska’s increased disruption in this one, as he always does. Stille credited the coaches. That might seem like a small thing, but doing what you’re supposed to do will keep a player on the field in this defense. Just listen to how Diaco described Stille after the game. Sound like a guy you can work with? Nebraska’s improving defense has a couple of those. Fellow outside linebacker Luke Gifford leads the team in tackles with 33. Inside linebacker Chris Weber is second at 31. In two games, Stille has looked a lot like those guys have for all of 2017 – they’re where they need to be most of the time and when they are good things tend to happen. Those three also share something else in common: They’re all Nebraskans. 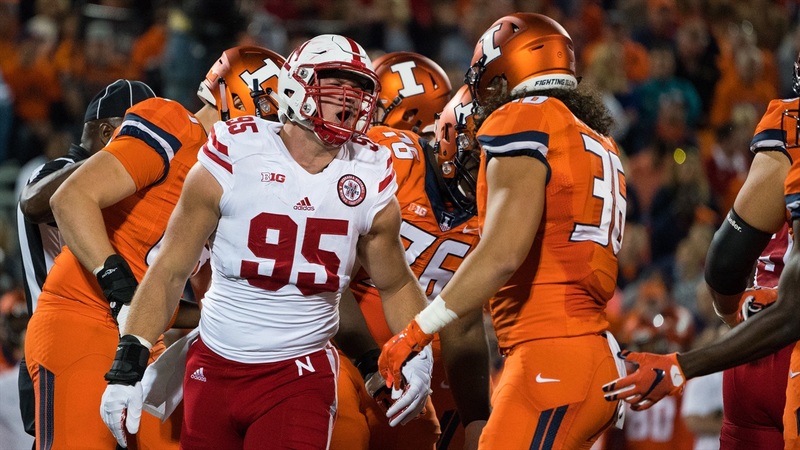 If it felt a little flowery then, maybe it should feel less so after watching Stille go from buried on the depth chart to Nebraska success story in two games. The Huskers’ defense, much maligned after six quarters this season, seems to be finding a solid group of guys willing to buy into the bombast, Nebraskan or not. Illinois and Rutgers are Illinois and Rutgers. Nobody’s pretending they aren’t, but since that first half against Oregon this young defense has surrendered two touchdowns in its 14 quarters since. The Huskers just held their third straight opponent to 250 yards or less for the first time since 2003. It’s progress Nebraska is going to need as Wisconsin and Ohio State head to Lincoln in the two weeks to come. And if Nebraska guys are part of the reason for that progress, well, that’s always going to play particularly well. It’s at least what this season wasn’t three weeks ago. There’s a specific word for it. Even the Jersey guy and former Hawkeye agrees. “Isn’t that fun?” were the first words Diaco said when asked about Stille. Seems like we have a consensus.